United Sustainable Surfacing of America (USSA) is a leading provider and installer of innovative surfacing systems that provide environmental benefits and meet green building and sustainability criteria. USSA is housed within World Recycling Surfacing Group, a 21st century "green" holding company that oversees the creative development of unique and valuable new products using recycled materials, as well as represents brands from industry leaders. Our goal is to provide the end user with guidance for all surfacing related needs from a single source. We strive to deliver innovative surfacing product technology and performance. We offer our select branded solutions through various distribution channels. Products may be developed and sold through contract manufacturing agreements, provided wholesale through licensing agreements, or marketed through a dealer network of certified installers. Our team's success is driven by years of passion and industry experience. With the growing demand to be "green" and the continual demand for environmental change taking place across in globe, we have been able to reach out and set forth higher industry standards for safer surfaces while addressing environmental problems. We are recognized as industry leaders, providing vertical integration through R&D, the manufacturing of raw material components and end products, installation services, consulting, maintenance services, recycling, and material supply. We track our efforts to divert tires from landfills and support the carpet recycling recovery effort to divert and recycle our non-infill synthetic turf products. Most of our systems qualify for LEED green building credits. Additionally, we provide full lifecycle management for our products and installations, using recycled materials wherever possible in product manufacturing and providing recycling options for our installations at the end of their useful life. 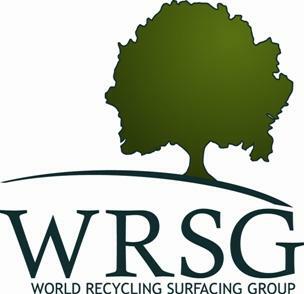 When your surfacing requirements call for premium quality, durability, and performance, World Recycling Surfacing Group ensures the right solution for you. Contact us today with your surfacing needs.